First make the dipping sauce as it should be served at room temperature. In a small bowl add 1 ½ tsp of corn starch with 3 tsp cold water. Stir to combine well and set aside to thicken. Meanwhile in a saucepan add the pina colada mix, ¼ cup water, crushed pineapple, coconut flakes and confection sugar and mix well over medium-low heat. Bring to a slow simmer for 10 to 12 minutes then add the thicken cornstarch and simmer for an additional 2 minutes. Pour into a dipping bowl and allow the dip to come to room temperature for service. 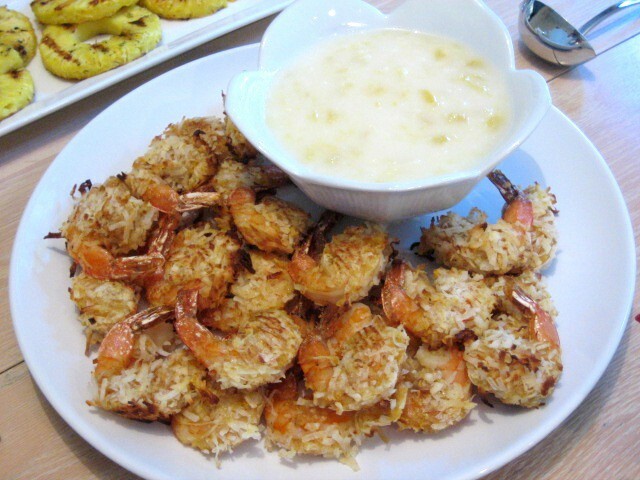 Prepare the baked coconut shrimp: First shell, rinse, de-vein and dry them with paper towel to remove any moisture. In a bowl add 1 Tbs honey and microwave for 10 seconds to liquefy the honey, add the 1 Tbs lime zest and 2 beaten eggs and combine. In a shallow dish combine the corn starch, bread crumbs, sugar, salt, white pepper and cayenne pepper and combine well. In another shallow bowl add the flaked/shredded coconut. 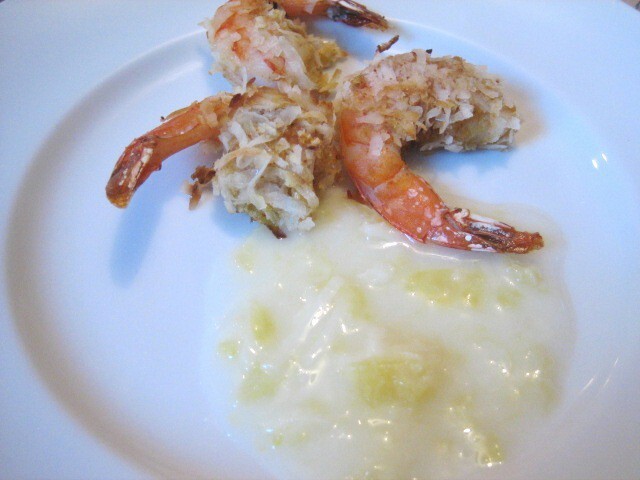 Take one shrimp at a time first dip in the egg mixture, them roll in the breadcrumb mixture, then dip again in the egg mixture and last roll in the shredded coconuts to coat well. Place on sheet pan lined with parchment paper and repeat with the remaining shrimp. Once all the shrimp have been coated and placed uniformly on the sheet pan give the tops a real quick spay of the cooking spay and place in the oven on the upper rack for 5 minutes. After 5 minutes turn the shrimp over and cook another 5 minutes. Turn the broiler on for 1 minute and remove from the oven. Transfer the golden brown shrimp to a serving platter along with the room temperature dipping sauce. The baked shrimp were crispy and the sauce was outstanding!